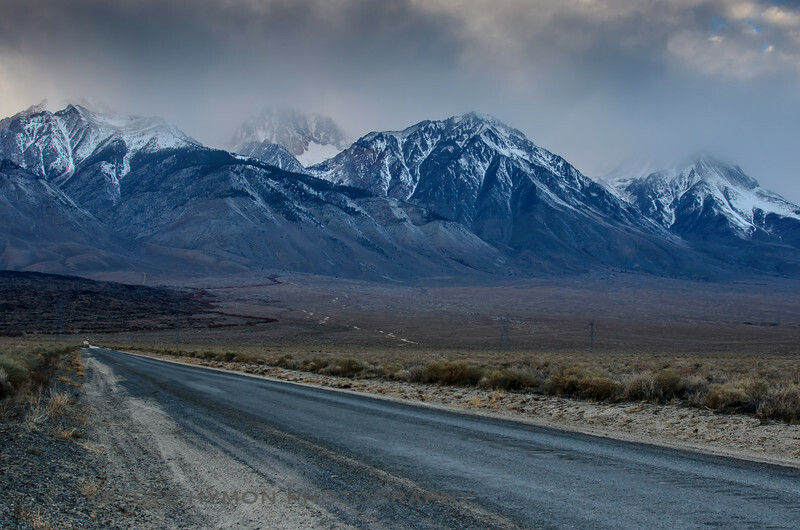 Here's another photo of the Eastern Sierra taken late Monday afternoon on my drive from Mammoth Lakes to Pasadena. Click above to see larger. The photo was taken about a half-mile west of U.S. 395 on the road leading to the start of the Taboose Pass Trail, which climbs more than 6,000 hot and dusty feet from the Owens Valley to the Kings Canyon National Park backcountry. I've never been up there -- that's a stiff climb, people. As for the photo, I took it with my Nikon D5100 using the Nikon 35mm 1.8 DX lens (in other words, that's about $650 of camera equipment according to current prices). No tripod -- I had forgotten it at home. I shot in RAW and edited in Adobe Lightroom. I didn't do much processing although I used the graduated filter tool to darken up the storm clouds and sharpen the image. I wish there weren't electrical towers in the lower part of the shot -- but, hey, they're part of the landscape. And if such crass commercialism doesn't offend you, follow me on Twitter where I occasionally dispense wisdom and links to this blog and my attempts to figure out what I'm doing photographically-speaking. This photo ©Steve Hymon and may not be used elsewhere without my advanced permission.